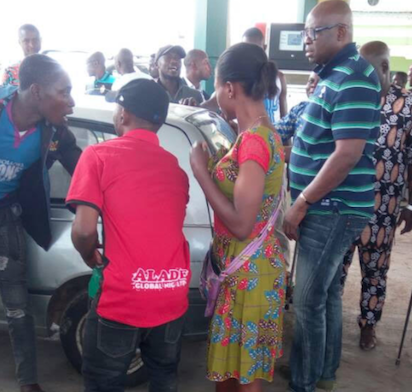 The Ekiti State Governor, Mr Ayodele Fayose on the Christmas Day supervised sales of fuel to motorists in Ado Ekiti in fulfillment of his promise to release 80 percent of the petrol in the Government House fuel dump to two petrol stations in Ado Ekiti to be sold at N145 per litre. The Governor also accused the All Progressives Congress, APC led Federal Government of deliberately using fuel scarcity to browbeat Nigerians into accepting increase pump price. The Governor said that though the Federal Government intends to increase the pump price, but it didn’t know how to go about it. Fayose who stated this on Monday while supervising the sales of State government assisted petrol at N145 a litre to the people at Alade filling station along Iyin road, Ado-Ekiti said that he decided to sell government petrol to people at control price so as to alleviate their suffering. He said, “this is the sacrifice we have to make as a responsible government to alleviate the suffering of the people, because this is a black Christmas. They can’t move. ” It is time for Nigerians to take me seriously that the Federal Government wants to increase the pump price. Ordinarily, the N145 is too much for the people not to talk of increasing it. Today I tell you that there is queue even at black market. “This also why I decided not to be parts of the $1 billion Boko Haram funds because our needs varies. Not until Nigeria is run like a federation, we will only be wasting our time. People must decide the way forward for Nigeria. However, some motorists including Mr Tope Joshua, Dr Kuku and Babalola Adeleye who bought fuel from the government assisted petrol sales lauded the governor for being sensitive to the plight of the people. They condemned the Federal Government for not making fuel available and for passing the bulk of their alleged failure to the marketers. 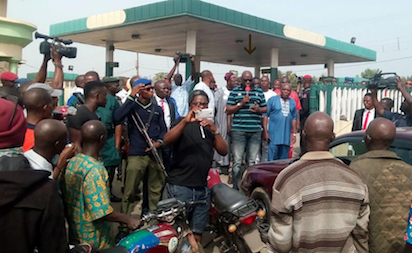 The post Fayose supervises sales of fuel at control petrol price of N145 appeared first on Vanguard News.